Consumers claim some Samsung washing machines come apart violently. RALEIGH -- The U.S. Consumer Product Safety Commission (CPSC) has issued a warning about certain top-loading Samsung washing machines after reports that some had exploded, ABC News has learned exclusively. The agency said it is working with Samsung on a remedy to fix the issue that apparently affects some units made between March 2011 and April 2016. ABC11 Troubleshooter Diane Wilson was the first broadcaster to report on the problem. One Holly Springs mom told Diane her 2-month-old Samsung Active Wash blew apart - scattering parts all over her laundry room. "Any one of us could've been in here," Price said. These aren't the only cases. ABC's GMA Investigates reported Wednesday it has learned that since early last year, 21 people have reported to the CPSC that their top-loading Samsung washing machines have exploded or blown apart. Several plaintiffs are suing Samsung in federal court in New Jersey. 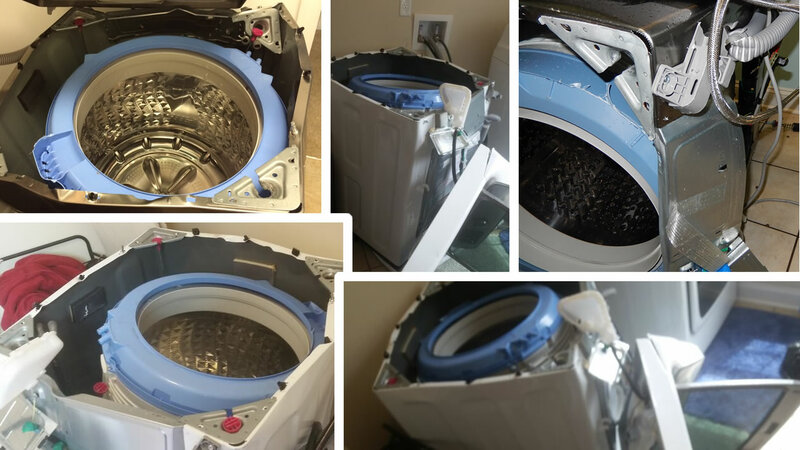 Their lawyer, Jason Lichtman, argues that a support rod in the top-loading Samsung washing machine is insufficient to hold the tub in place and can become unfastened during the spin cycle. "The rod can slide right out," Lichtman said. "And that's what causes the washing machine to blow apart." In a statement Tuesday, Samsung told "GMA" Investigates: "In rare cases, affected units may experience abnormal vibrations that could pose a risk of personal injury or property damage when washing bedding, bulky or water-resistant items. It is important to note that Samsung customers have completed hundreds of millions of loads without incident since 2011." Until the remedy to this safety issue is in place, the CPSC and Samsung are advising consumers to only use the delicate cycle when washing bedding and bulky items. They say the lower speed lessens the risk of impact injuries or property damage due to the washing machine becoming dislodged. Consumers can contact Samsung for more information and to determine if they have an affected washing machine. CPSC and Samsung are working on a remedy for affected consumers that will help ensure that there are no further incidents. We will provide updated information to the public as soon as possible. Consumers can contact Samsung for more information. Consumers should report any incidents to CPSC via our website www.SaferProducts.gov.